To address industry needs for cost efficiency and reliability, while reducing weight and installation time, Oil States has designed a connector with a solid history of performance. 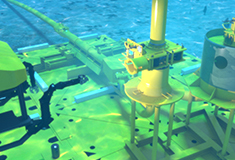 The Oil States Multi-Segment Clamp is a robust, clamp style connector for deepwater applications. The clamp is designed for quick, easy installation of jumpers, tiebacks and flowlines via ROV interface. See the Multi-Segment Clamp Connector animation here.